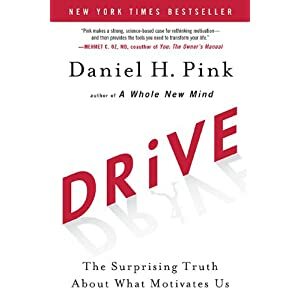 Another audio book finished: Drive: The Surprising Truth About What Motivates Us by Daniel Pink. Excellent book! If you've read any of the books mentioned in previous blog posts you will notice that you've already heard many of the examples that he uses. He quotes experiments done by Dan Ariely in Predictably Irrational and also uses many of the same examples as him. He also quotes the oft quoted Wikipedia example which I'm getting tired of. In Drive, Dan discusses what motivates us and demonstrates that extrinsic motivators, if - then rewards, only work on routine tasks and have a negative impact on creative work which require intrinsic motivators. He talks about a new "Operating System" for business revolving around the three elements of Autonomy, Master, and Purpose. Autonomy - people want to direct their own lives. Mastery - we want to get better and become experts or go-to-guys for something that matters. Purpose - that what we are doing is in the service of something larger than ourselves, something meaningful. I think that as a software engineer it's pretty easy to be in a job that satisfies the first two elements. Most development work is based around results and we're given the autonomy to produce those results. We have to master the subject to be able to do the job. Those are a given. I think that the job of software engineer might fall short when it comes to purpose and it's sometimes difficult to see the big picture of what you're contributing to. FedEx Days - Australian software company Atlassian give their employees a FedEx day once a quarter. Engineers start work on a Thursday evening at 5pm and have to deliver something by 5pm on the Friday - i.e. have to deliver something overnight - hence FedEx - so long as it has nothing to do with their regular job. Google 20% Time - 20% of your time is spent working on a project that might benefit the company but has nothing to do with your day-to-day work. Similar to FedEx Days but you're given 1 day a week to do this instead of a 24-hour period once a quarter. ROWE - Results Only Work Environment. No schedule, don't need to be in the office, meetings are optional. Personally I think that you have to have the right type of employee to make this work.